What a fitting end to a great season! The last race had all three of your top points leaders battling it out for a great finish. 2016 was the third season for PopWing racing, and I am pleased to tell you that it is growing and becoming more popular because it is just so darn fun. This season we had return pilots, as well as plenty of newbies joining in on the controlled chaos that is pylon racing with a near-disposable, very durable, low budget aircraft. PopWing racing requires cooperation as well as a competitive spirit. It succeeds because we all want to race, but we all want to help others race too. Each month, I witness people helping other racers keeping their wings race-ready. Whether it is giving someone an O-ring, a prop, or fixing a break with some CA glue, everyone works together to keep the races going. PopWing also requires people to work together as callers and turn marshals. PopWing racing also allows you to sharpen your skills when flying other aircraft as you soon learn how when the race timer goes “DING”, you need to control your nerves to stay on a clean line through the course. 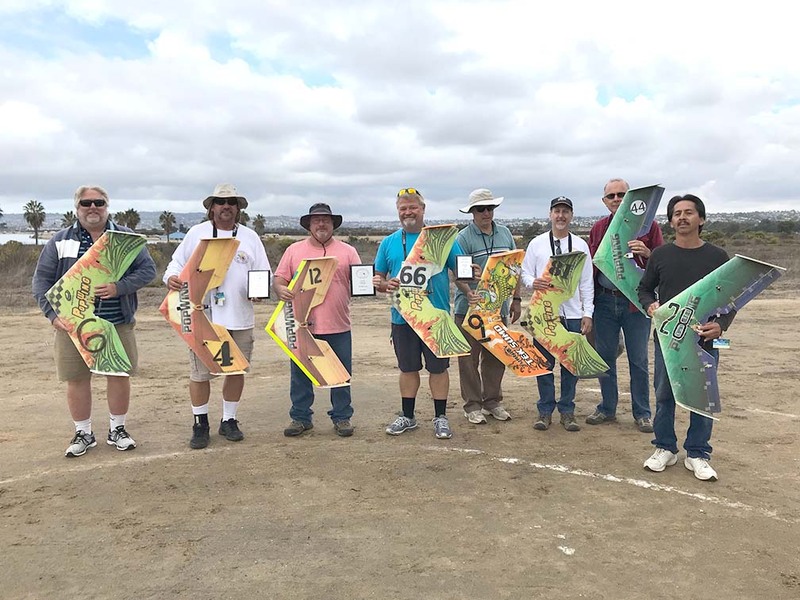 PopWing racing was designed to bring club members together for some common fun, not close the field for a full day, and give back to the participants. This year due to our 400+ club member totals, we were graciously granted the largest value ever for end of year prizes and awards. Trophies, gift certificates and airplanes were given out. Most of the prizes were raffle-based, so anyone that participated in 2016 had an equal chance to take home some goods. In a slight twist to the usual “must be present to win” raffle, all the racers present for the last day agreed to include EVERYONE that participated during 2016 season into the raffle, not just the members present for the last day. That actually worked out well as some of the goods were awarded to members not present or participating at the last race. Scoring will have a slight tweak next year, we will be awarding 1~4 points for qualifying positon as an incentive to not sandbag during qualifying runs since main event points are the same across all the mains. We will also hold a “PopWing Clinic” before our first race in 2017 on Jan 14th. Be sure to plan accordingly so you can learn some tips, tricks and secrets to tuning your PopWing as a worthy racer. Kudos to our points leaders who made were sure to make it to each race, and truly hold that competitive spirit. 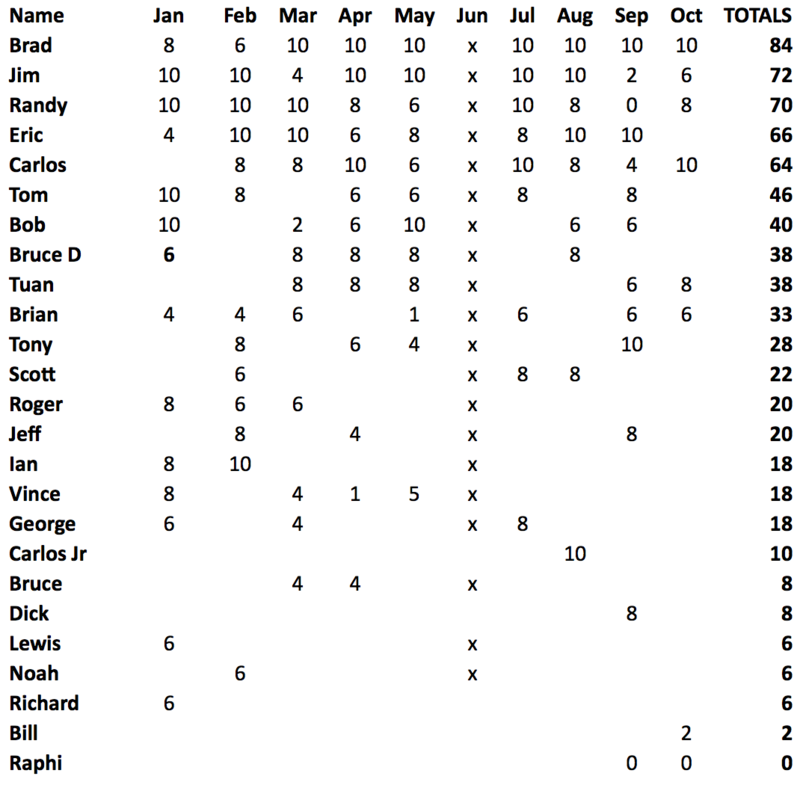 Brad, who had 6 consecutive 10 point days (broken only by the one month we skipped), Jim, who also had 6, 10 point days (non-consecutive) and Eric & Randy who each had 4, 10 point days during the season. Thank you to everyone that participated, and all the other club members who let the field have these special events month in, and month out. Go to Nitroplanes.com or HobbyKing.com for the aircraft. Often they are on sale for $59, and usually have a regular price of $65. Just put your number on as specified in the instructions. Racing is FREE. There are no entry or participation costs above your regular club membership.